Fitness starts in your mind. Ask any athlete or fit person what the number one secret is to their success at fitness, and they will tell you it is commitment. Commitment means that you are in it for the long haul. Commitment rises above bad days, hectic schedules and volatile emotions. Commitment hangs in there when you don’t want to do it, when you don’t feel like doing it and when you don’t have time to do it. True commitment doesn’t depend on how you feel. It depends on your integrity and on living for the purpose you have set for yourself. 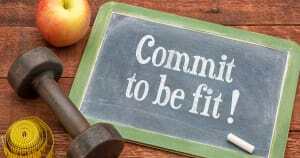 Are you committed to get and stay fit? Committing to be fit eliminates the weekend warrior syndrome. You may know a weekend warrior. They are the person who does little physical exercise during the week, but when the weekend arrives, they blast out of the gate like a Tasmanian Devil. In a desperate attempt to make up for sedentary behavior all week, they go all out trying to play 'catch up', often pushing themselves to the limit. The result, however, is not what they expected. They will likely end up with an injury because their muscles, tendons, and joints are not conditioned for these sudden bursts of intense exercise. Physical fitness depends on consistency. And consistency requires commitment. It takes consistent, near-daily exercise to cause your body to make the changes that bring about fitness. For example, your joints and tendons will strengthen, your aerobic base will improve as your body becomes more efficient at utilizing oxygen and ridding itself of carbon dioxide, and your endurance will increase. In fact, that you do something consistently is as important, or maybe even more important, than what you actually do. Even if you are just doing low intensity walking, doing it every day is infinitely better than doing something more strenuous only occasionally. But the real rewards come when you not only commit to intense workouts, but you also commit to being consistent with those workouts. You have access to a great facility, classes, and equipment plus the support of the best Coaches and Trainers in Ramona, it's up to you to bring the right mindset to the table and be committed to the process. If you are committed, the rest of the pieces will fall into place. Don’t overthink this. Stay consistent, and commit to doing something every single day. You've got this!